Home > Economic policy > Technology, R&D and Innovation > Technology Centre of the Academy of Science: How to step up the international engagement of Czech research organizations? Technology Centre of the Academy of Science: How to step up the international engagement of Czech research organizations? 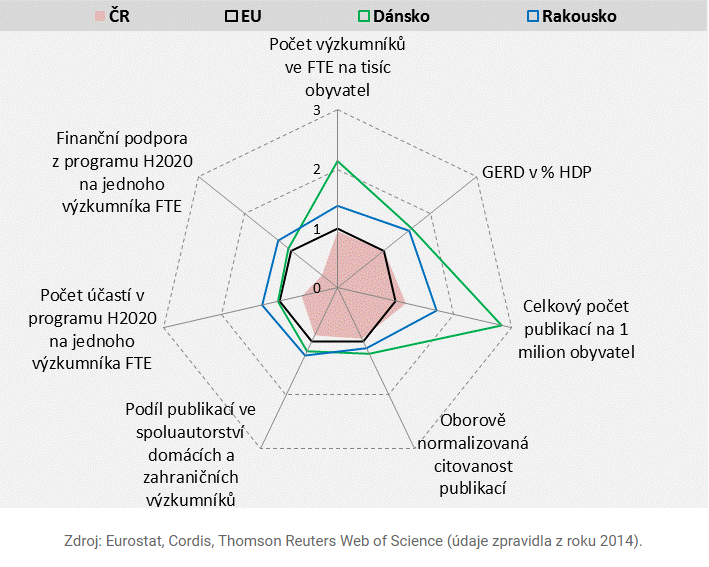 The quality of the Czech system of research, development and innovations has improved over the past years; almost all indicators have improved. But we still lag behind dramatically in international cooperation, Technology Centre of the Academy of Science writes. A major problem is that the criterion of intensity of international cooperation is not among criteria used for the assessment of research organizations' performance (and the organizations' performance is used as one of the criteria for allocation of funding). The system focuses primarily on R&D results of research organizations. This has to be changed, the Technology Centre says. The infographic below shows (clockwise) GERD as % of GDP, Total no. of publications per 1 mil. of inhabitants, Field normalized citations of publications, Share of publications in co-authorship with domestic and international researchers, No. of participations in the H2020 per one researcher (FTE), Financial support from the H2020 program per one researcher (FTE), No. of researchers (FTE) per 1,000 inhabitants. Comparison is made for the Czech Republic (red area), EU (black line), Denmark (green line) and Austria (blue line). Also, the Technology Centre launched a database comparing systems of research, development and innovations for 20 countries in and outside the EU at http://rdsyst.tc.cas.cz, including Australia, Belarus, Brazil, China, France, India, Izrael, Japan, Korea, Mexico, Germany, Russia, Saudi Arabia, Singapore, Slovakia, Switzerland, USA, Vietnam, South Africa, and Canada, in categories Summary & Recommendations, Socio-economic profile, Basic R&D indicators, Administration and Management of the R&D system, International Cooperation, Research organizations and infrastructures. More details in Czech. Also, Masaryk University in Brno wants habilitation theses, for which the docent academic degree is granted, only to be written, defended and assessed in English or in another world language as of 2021 as the first Czech public higher education facility, Lidove noviny (LN) and CTK, the Czech News Agency, wrote earlier in May. The Masaryk University Academic Senate decided on this change recently to meet international standards. "We have agreed that the local (academic) community is so small and interlinked by personal bonds to such a high extent in the Czech Republic that we must open the assessment to an international community," Masaryk University Rector Mikulas Bek told LN. Technical University (CVUT) in Prague is considering this step, too. Its management supports an international character of habilitation commissions with foreign members, Zbynek Skvor, its deputy rector for research, said. Read full article.